Genesis is the most powerful all in one board we’ve ever built for all types of robots. Just check out the features and you will find us right. 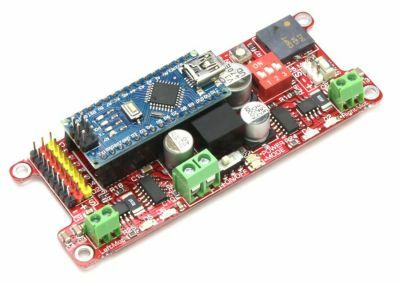 Our flagship board Genesis, includes Arduino Nano, powerful 3A motor drivers, 0,5 Ampere 5V regulator and complementary circuits for your robot project. Motor Currents: Continous 2 Ampere x 2, Burst 3 Ampere x 2. Built-in temperature, current and overvoltage shutdown circuits at motor controller ICs. Built-in short circuit protection at power lines. Just 98mm x 38mm x 18mm sized. 4 Mount holes have 3,2 mm diameter, suitable for M3 sized screws. Board weight is 33 grams. 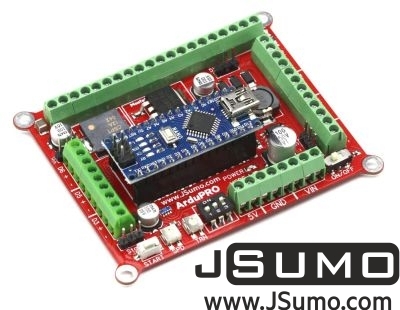 If you want to use Arduino Nano at your robot project (Minisumo, line follower etc…). 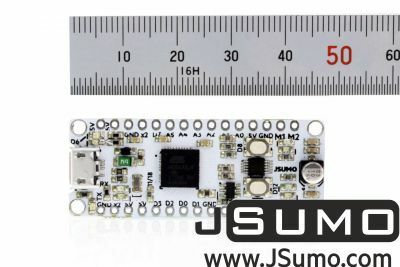 This board must be your first choice.Small size and high power in your hand. With high-quality components and strong infrastructure; Genesis will be your favorite board. We didn’t use moderate speaker at Genesis. We chose the highest quality speaker for clear & loud sound. You can send output any tone by sending frequency to this speaker. At the board, it has one start button which is parallel connected to start module input pin. The board is fully compatible with start modules. 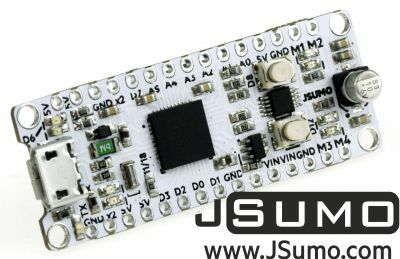 When you push the button it send Logic 1 (5V) signal to Arduino Nano. 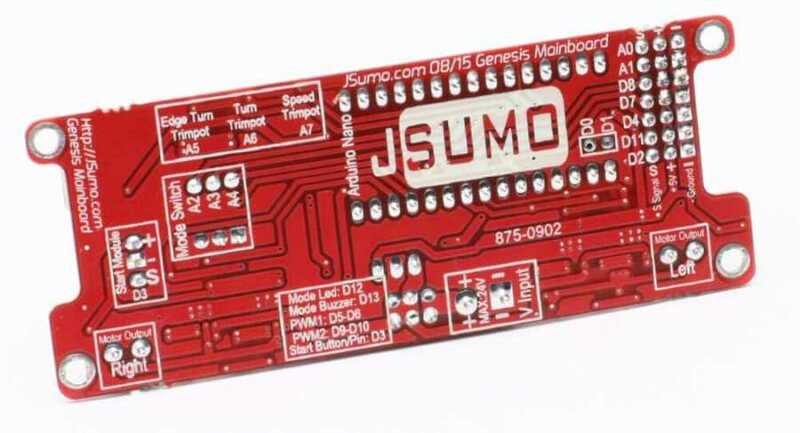 Genesis Board contains 3 pin dipswitch for total 8 start tactics (for mini sumo robots) Except mini sumo; the dip switch can be used for any purpose. Genesis contains 4 motor direction leds (2 Right, 2 Left), 1 Power led and 1 Mode Led. 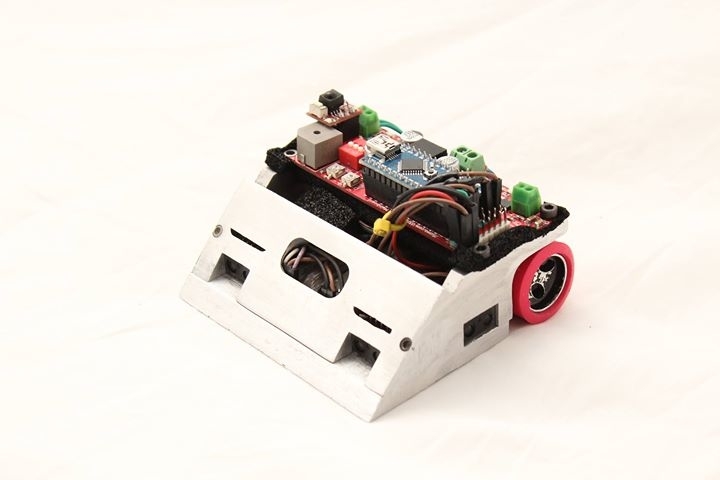 With indicator leds, you know the robot’s behavior easily. Each sensor input has 3 pins (-,+,s) and clearly written name. You can plug female cables directly. Signal pins connected to Arduino Nano with small value series resistors for safety. You can connect up to 8 different control element to this pins. What is More? Why you should prefer Genesis? At the Genesis’s heart, we use 570 kHz high-speed switching mode regulator. With combined multilayer ceramic capacitors, electrolytic capacitors and tantalum capacitor, Board’s voltage output is pure 5V for adding sensors. Voltage Regulator also has short circuit protection. 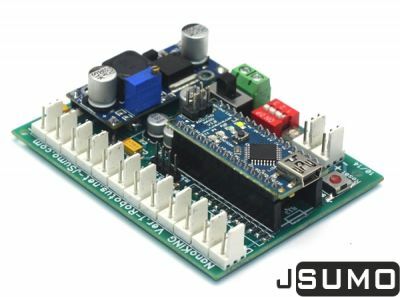 Genesis uses 2 Mosfet driver for giving high current to motors. 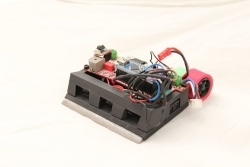 Thanks to modern MOSFET bridge design; power sent to motors have nearly zero loss. 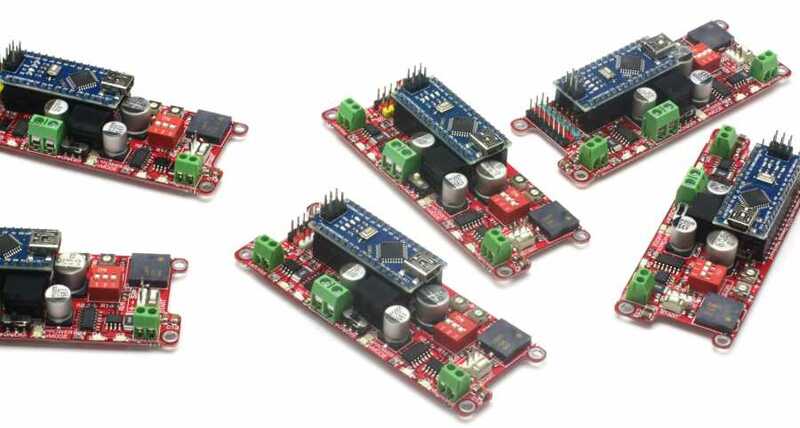 Each motor driver connected with 2 PWM channel. So in total Arduino Nano’s 2 PWM channel is used for controlling 2 dc motors up to 3 Ampere each. 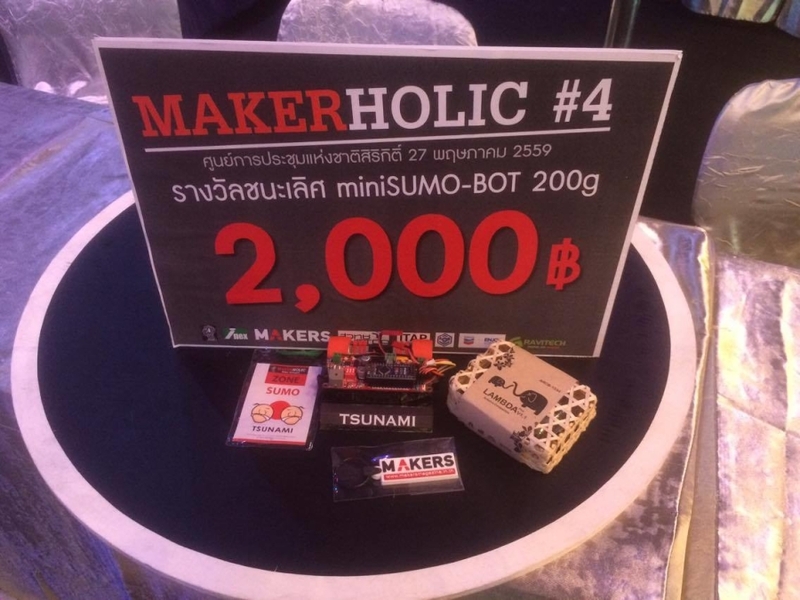 We inspired from Japan sumo robots while creating that board. That robots use multiple trimpots for saving important variables for working program. Also Genesis includes 2 trimpots for same purpose. 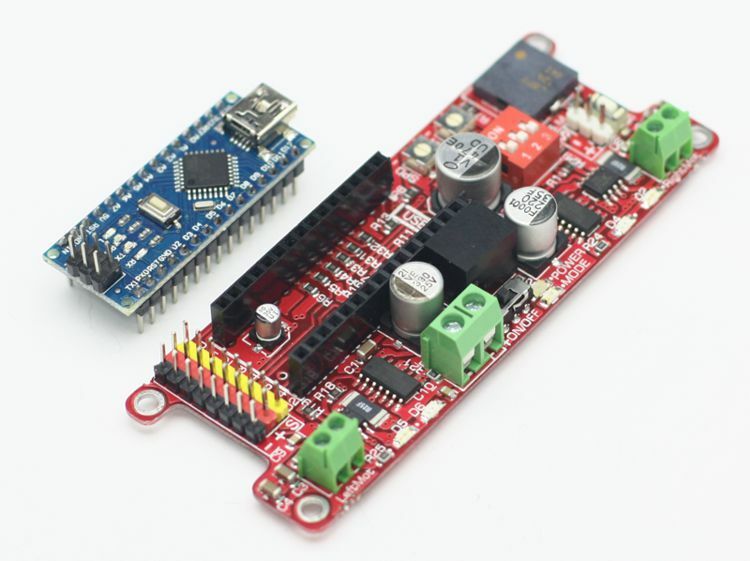 That trimpots directly connected to Arduino Nano’s analog pins (A6, A7). 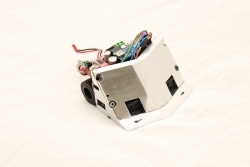 And for Mini sumo robot they serve as Idle Speed, Starting Turn Time, and Edge sensor seen Turn time changers. SPD: Idle Speed while not opponent seen, TRN: Starting Turn Time, Angle Trimpot. 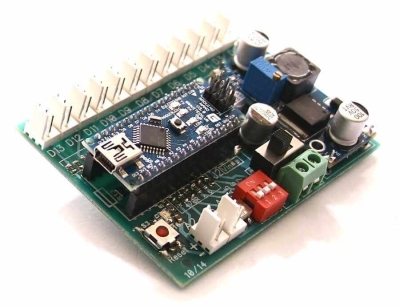 At the heart of Genesis, it uses Arduino Nano for micro controlling unit. Which is miniature version of Arduino Uno. You can easily upload, debug programs by open source Arduino community. 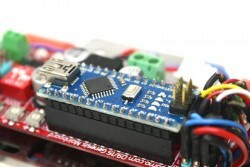 Learning Arduino is very easy. 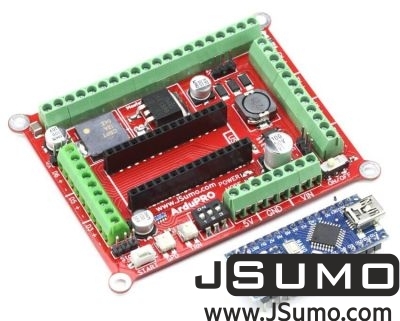 If you plan to use that board for minisumo we have well written, commented Arduino program for you also. Every Genesis shipped with Mini USB B cable, so you can program fastly when you take package.